I realise with horror I didn’t write-up yesterday’s Card of the Day, so I’ll do both in today’s post. 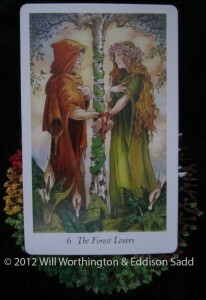 Yesterday, was the 6th Major card, The Forest Lovers. 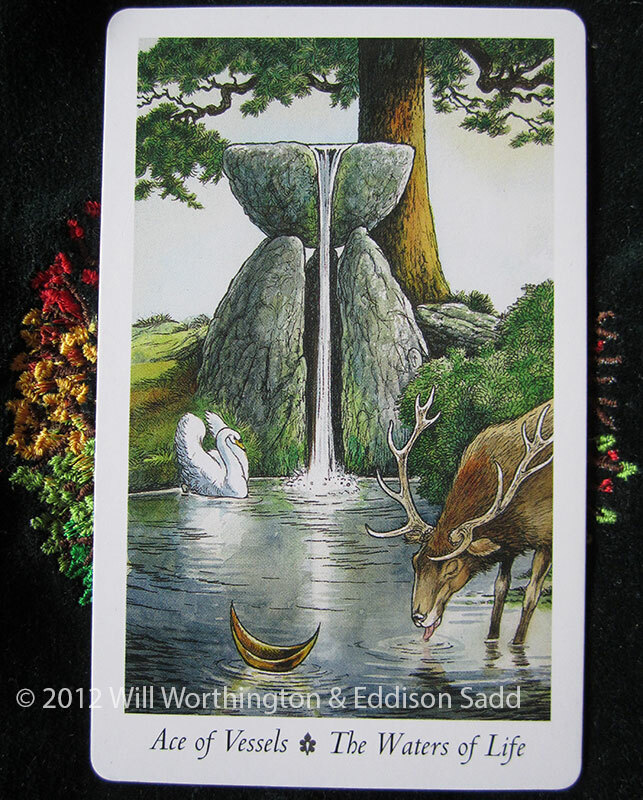 Today, the Ace of Cups joins us and both convey messages individually and together that I so need to hear. Yesterday I feel was a reminder to be gentle with myself and to love myself. I’ve not been great at doing that of late, pregnant or not, this cold just won’t shift and there’s not much I can take for it either, given my current medical state. It’s also a reminder to be gentle with others around you. The Internet is great for certain things, but it also has a nasty, cold side that can leave people in a rather bruised state. How we might word things when we can add a soft voice to them may look harsh when written out in detail. How we are meant to interpret something in this cold medium comes down to skill and the mood the reader is in at the time it is read. 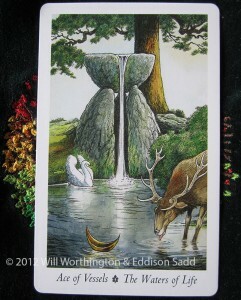 The other card, which came up today, is the Ace of Vessels: The Water of Life. It’s linked to our emotions and the aces are the new beginnings. There comes a time when we have to begin again, because there’s no where else to go. 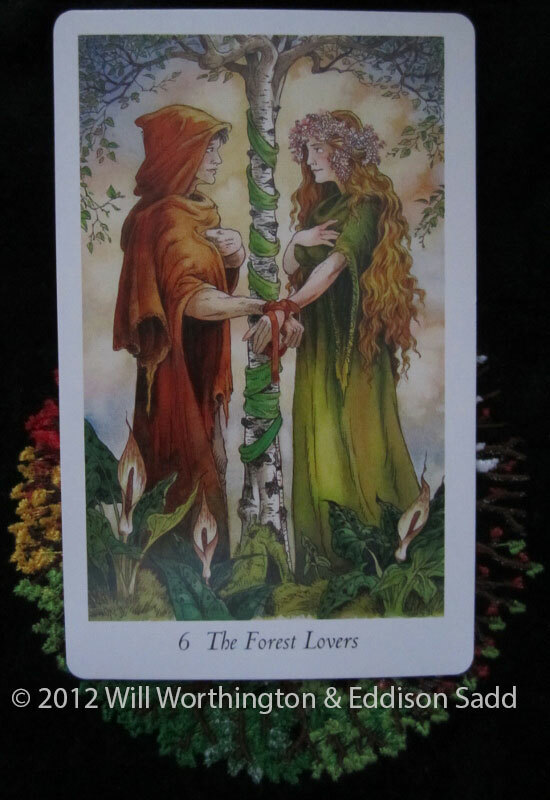 Like the labyrinth at the foot of the Great Oak Tree in Major #21 ~ The World Tree card, we often come to a dead-end, a point where we cannot continue, so we must begin again. This card says: “Feel it in new ways”. Often, it’s a case of take a big deep breath (or several!) and then work out what’s causing the bad emotions and changing how you work with them. That is by far, easier said than done I realise that, but its better than sitting there, crying and feeling sorry and down about something you can do something about. You can do something about how you feel, how you react emotionally, if you react in that capacity to begin with. I wear my heart on my sleeve and I often act with my emotions than I do with my logic. (Though, I’ve never claimed to be the wife of Mr Spock, I am married to a pedant!) Today, it’s a case of understanding it and being gentle with thyself. What do these two cards mean for you today? Do they hold any different significance for you and do they “feel” right for you? Come and share, I love discussing them! If you’d like your own private session, you can book yours via this page.